Machiavelli discussed in his seminal work The Prince, the difference between gaining land through inheritance and gaining it through skill. 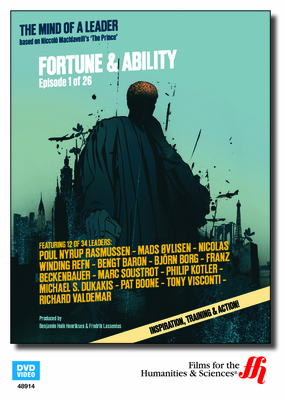 This DVD focuses on the ability to accumulate wealth through skill and effort. This program features Tony Visonti, a music producer known for managing acts such as U2. Tony believes that many leadership qualities are things that people are born with. However, individuals posses the capacity to learn the abilities and qualities of a great leaderr. In this program, the necessary qualities of luck, talent and hard work necessary for success are examined and addressed. This product is ideal for those that have the ambition, drive and desire to rise to the top of their organization.